Let me introduce a gluten-free cereal on my blog called “Ragi” or “Finger Millet“. It is known as “Panji Pullu” in Malayalam. Ragi is widely grown and consumed in India. Once considered to be poor man’s companion, Ragi is now well-known for it’s nutritional benefits. Ragi Flour is made into a porridge (Kurukku) and given to infants because of its high nutritional content. My mom doesn’t remember feeding me Raagi as an infant but my adorable nephew likes Ragi Kurukku. Seeing him eat Ragi without any objections made me want to try Ragi in my diet. 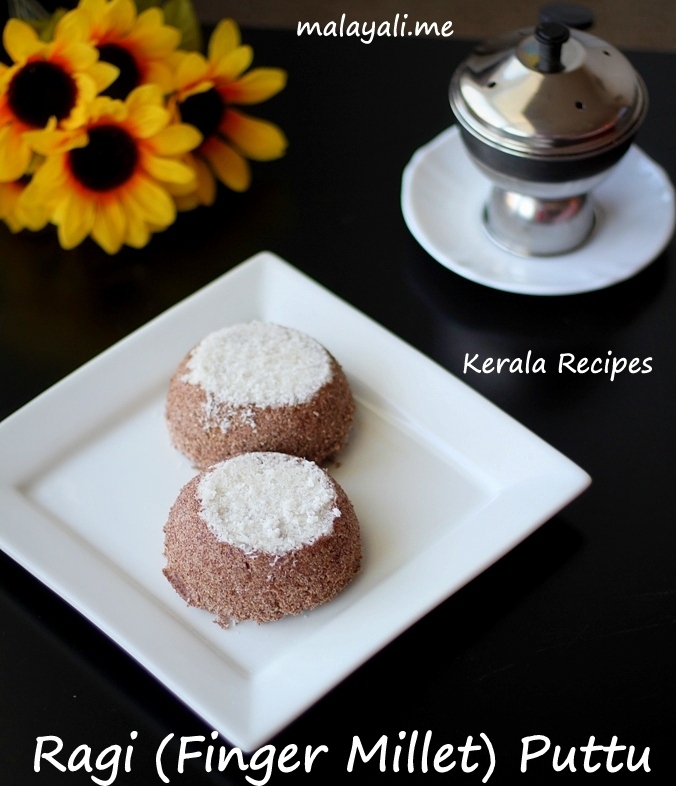 Of course, I decided to make the popular Kerala Puttu using Ragi Flour. I was worried if it would have a strong taste but I was happy with the results. It tasted very similar to Rice Puttu. Hubby liked it and now Ragi Puttu is seen frequently on our Breakfast table. Finger Millet is high in fibre, calcium and iron. 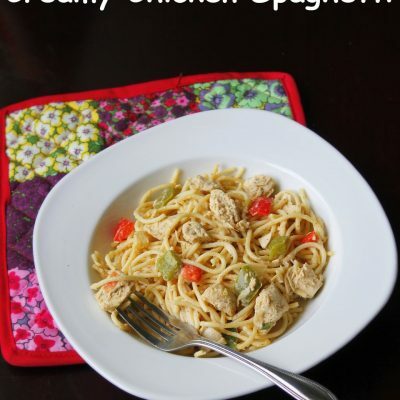 It can be used instead of wheat by those who have celiac disease. There are many different Indian recipes which use Ragi like Dosa, Idli, Roti, Laddu and so on. Take ragi flour in a bowl. Add 1/4 tsp of salt and crushed cumin to the bowl. Combine everything with your hands. Sprinkle 1/2 cup of water little by little and start mixing the ragi flour with your hand. Be careful while adding water. The flour should get wet yet retain a powdery consistency. If you add too much water it will change into a dough. When done, you should be able to roll the flour into a ball with a tight fist but it should powder back when crumbled. Pulse the wet flour in a mixie or spice grinder so that there are no lumps. The flour will become fluffy and aerated. Bring 1 cup water to a boil in a Pressure Cooker. Add 2 tsp of grated coconut to the bottom of the Chiratta Puttu Kutti (utensil for holding the flour). 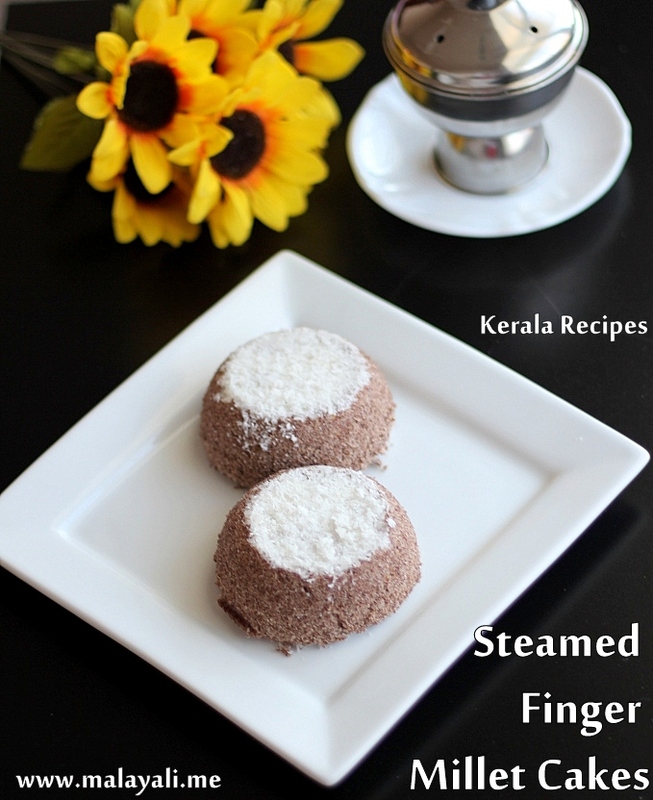 Follow with spoonfuls of ragi flour till you almost fill the Puttu Kutti. Top with 1 tsp coconut. Steam for around 3-4 minutes so that it is fluffy and cooked. 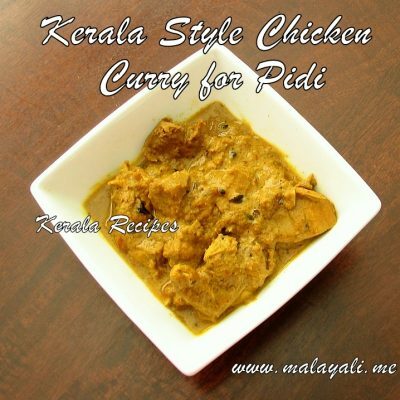 Serve with Banana or any spicy curry like Kadala Curry. It is important to get the right consistency while mixing the flour with water. If you add too little water, the flour will be dry and will not hold shape after it has been steamed. If you add too much water, it will change into a dough and you will not get a fluffy Puttu. Here is the picture of a Chiratta Puttu Kutti – utensil shaped like a halved-shell of a coconut. I use this more often than my regular Puttu Kutti since the contents get cooked quickly. Looking yummy. . Very simple. . No oil needed. . Good for health. . Thank Youuuuuuuuuuu. . I tried this today. . Really good. . 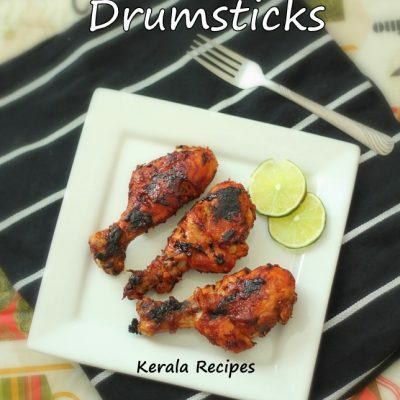 I don’t have puttu kutti (the pot) .. what shall I do ? 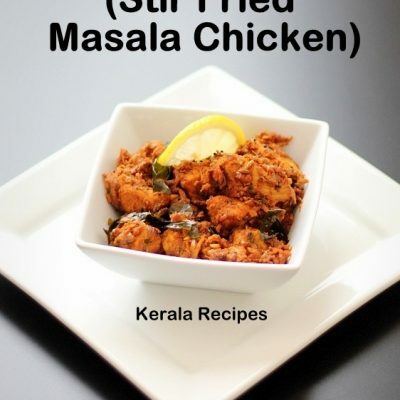 You can steam it in a idli pot or a steamer dish. Where could I get the chiratta puttu kutti? 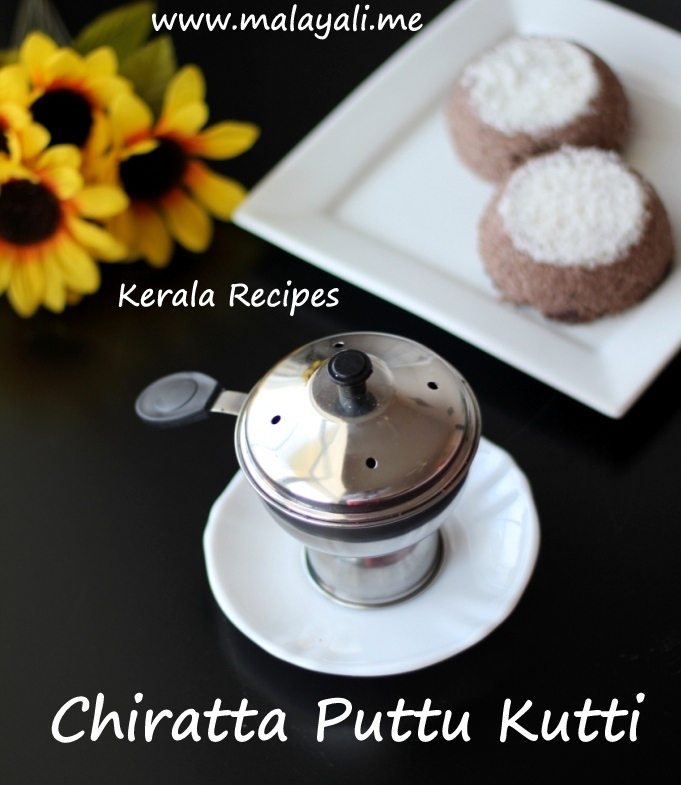 You can find chiratta puttu kuttu in Indian stores. I bought it from Kerala a couple of years ago. 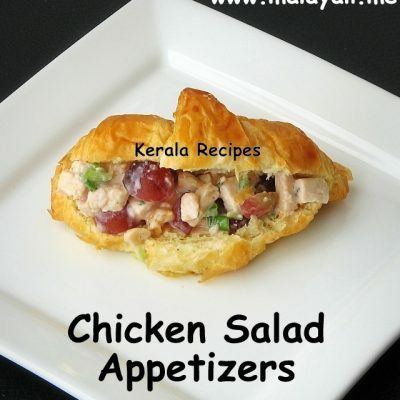 its really healthy food..we used to make..better to buy from nearest grinding mills..